Websense ThreatSeeker Network intercepted a malware campaign targeting BlackBerry customers. These fake emails state that the recipient has successfully created a BlackBerry ID. According to Security Labs, those users who are targeted receive an email with the subject line “Your BlackBerry ID has been created.” The email encourages users to follow instructions in the attached file on how to “enjoy the full benefits” of their ID. 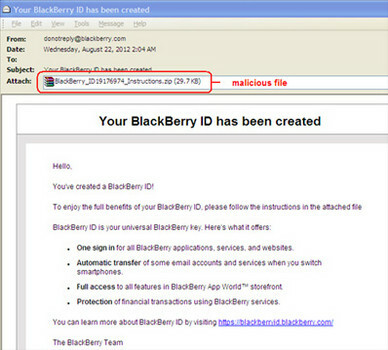 The malware comes attached to an email that is an exact copy of the email you receive when creating a new BlackBerry ID. It teases you by asking you to download an attachment that allows you to fully appreciate the BlackBerry user experience. Those who open the attached .zip file will drop a handful of executable files that will modify the system registry to start malware programs upon the machine’s next startup.